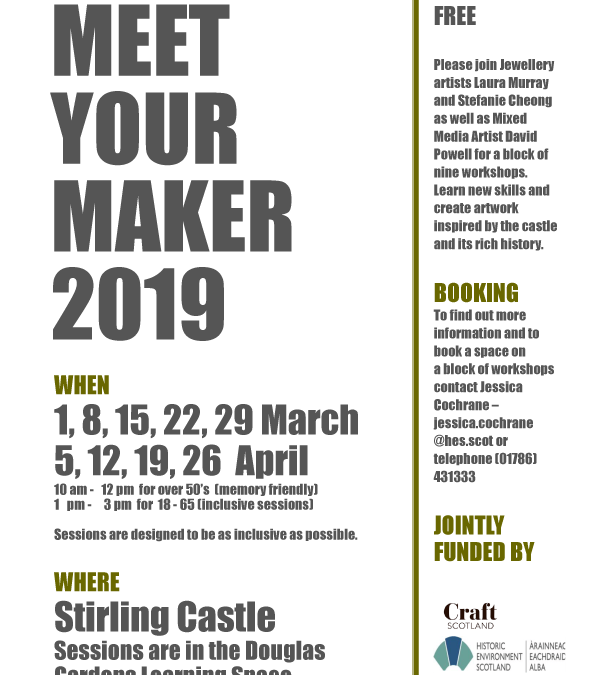 Please see the attached flyer for FREE and inclusive creative ‘Meet Your Maker’ craft sessions taking place at the beautiful historic surroundings of Stirling Castle. 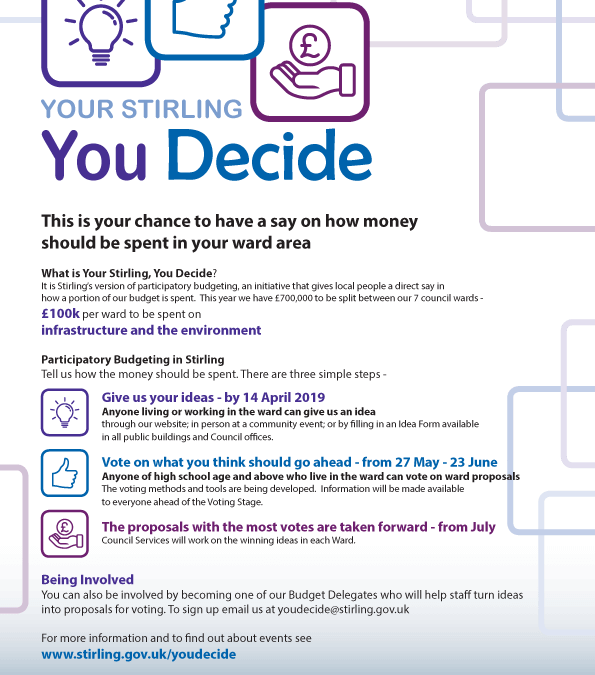 Your Stirling: You Decide is Stirling’s version of participatory budgeting, an initiative that gives local people a direct say in how a portion of our budget is spent. 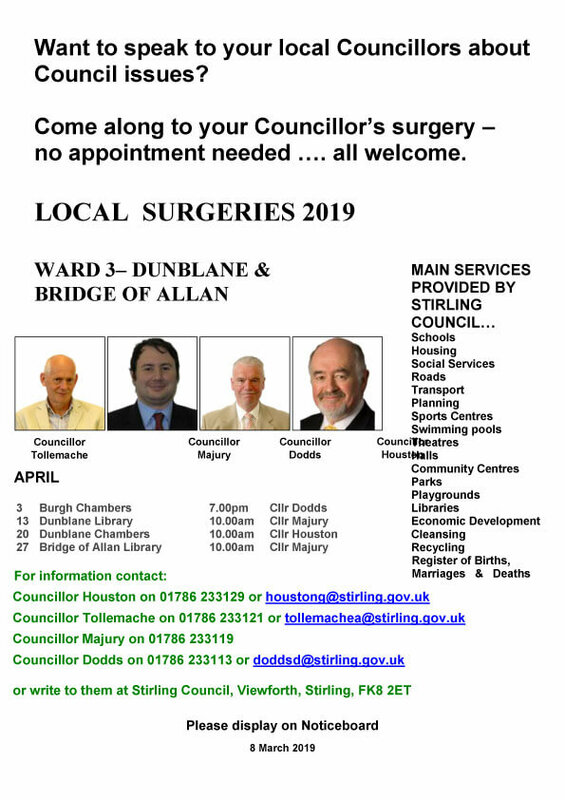 Between March 2019 and June 2019, citizens across Stirling’s seven electoral wards will have the chance to influence how to spend £700,000 of public money (£100,000 in each of the seven ward areas). This year the money can be used for infrastructure and the environment. This could include for example – roads, pavements, parks, playgrounds or public spaces.  Anyone who lives or works in the area, including local groups can give us an idea of what the money should be spent on. 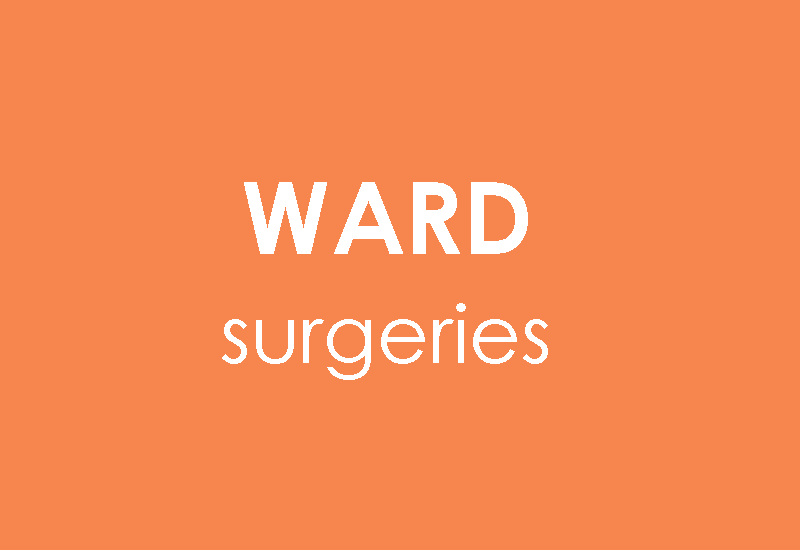 Ideas will be developed before being voted on by people living in the ward. Those receiving the most votes will be taken forward by services. The Project Team, who will turn the ideas into voting proposals, will include Budget Delegates. Budget Delegates are members of the public, of high school age and above, who live in the area and would like to represent the public on the Project Team. For more information and to express your interest see the Budget Delegate Pack on our website. 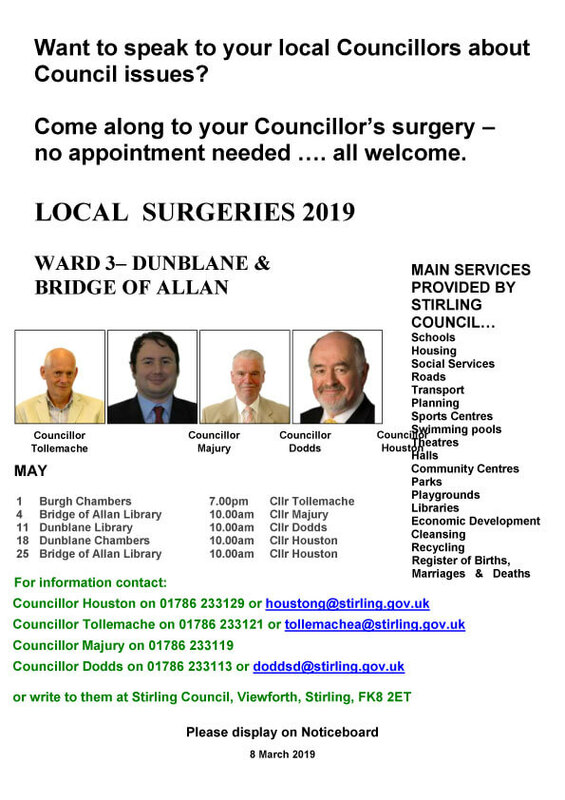 Details of upcoming Councillor Ward surgeries are attached below. 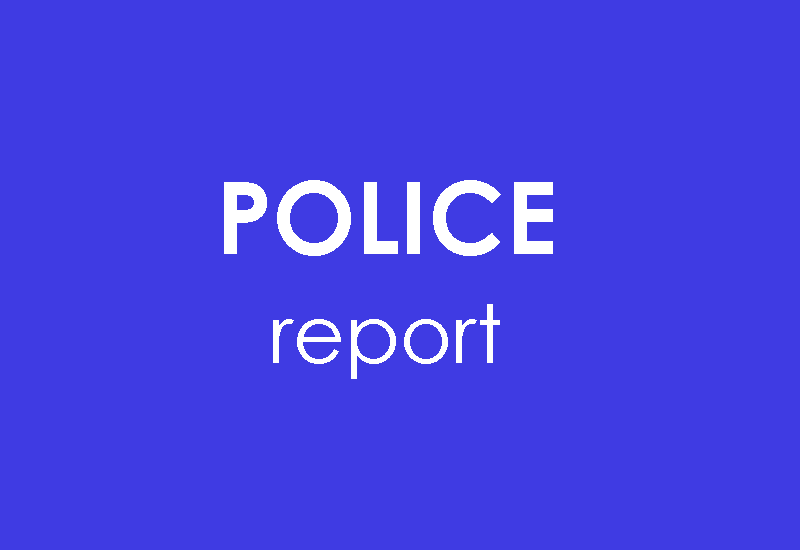 We’ve been furnished with the March Police Report. A copy is attached. 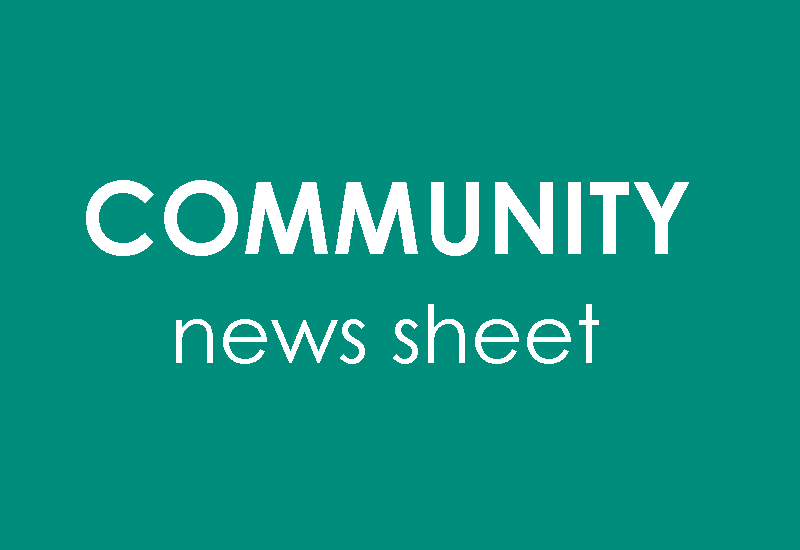 Stirling Council have issued their Community News sheet for February. You can find a copy attached below. Improved links for students across the Forth Valley. Direct links to Stirling Community Hospital (Stirling Care Village) from Bannockburn, Cowie and St Ninian’s. Improvements to Stirling University’s Uni Link services based on consultations with the University staff and students. Additional links to University from the Hillfoots at peak times during term. 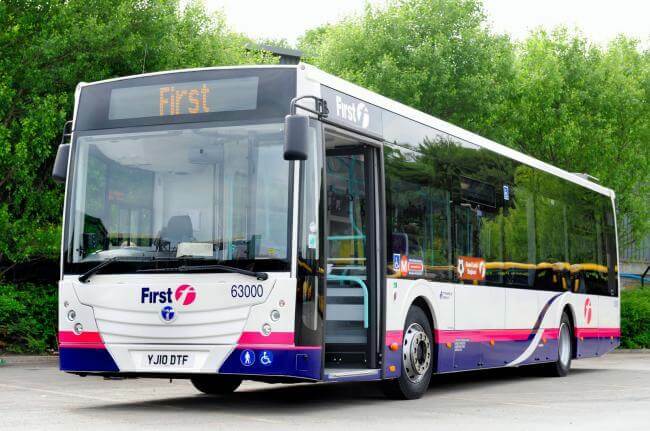 First Scotland East are pleased to announce service improvements on it’s Forth Valley network following feedback from Customers, Stakeholders and following attendance at various local community meetings. The First Scotland East team has taken on-board comments and requests, and after consulting with the relevant Local Authorities are now making further improvements to the network which are detailed below. Following some very productive and engaging meetings with Cowie Community Council and other local stakeholders, the Service 54 will now be extended to provide a direct route to Stirling Community Hospital (now known as Stirling Care Village) on an hourly basis for most of the day covering Cowie, Bannockburn, Stirling, Cornton, Bridge of Allan and the University. There is also a revised timetable in the morning for the existing route to improve timings at the peak. Students from Cowie, St Ninian’s and Bannockburn will also now benefit from extra journeys covering Stirling University at times of operation. Service 55 will introduce a new term time peak only schedule to support students travelling from the Hillfoots to the University covering Tullibody, Alloa, Tillicoultry and on to the University, based on discussions with Stirling University. Finally, Service 51 will now operate an additional evening journey from Cowie to Stirling City Centre in response to a request by Cowie Community Council. All revised changes will be effective from February 18th, 2019. Please refer to revised timetables for full details. Andrew Jarvis, Managing Director for First Scotland East said: “We are pleased with the feedback and continued support we have received from our customers across the Forth Valley and the surrounding areas over the past few months with our new simplified network. Service 51 – Cowie, Bannockburn, Stirling, Alloa – Revised timetable. One evening journey from Stirling to Cowie added in response to customer feedback. Service 54 – Cowie, Bannockburn, Stirling, Cornton, Bridge of Allan, University of Stirling – Route extended from Stirling to Cowie via Community Hospital approx. once an hour. Also revised timetable in the morning for existing section. All the changes introduced as a result of consultations and requests with customers and local councils. Service 55 – Tullibody, Alloa, Tillicoultry, Menstrie, University of Stirling – New peak only service introduced in response to University feedback. Service will operate during University semester.